Moongdal is known as Pesara pappu in Telugu, and my today's recipe is a Andhra style tomato curry cooked with yellow moongdal. This tomato pesarapappu is a comforting dal which can be served as side dish along with rice or else simply with Indian style of flatbreads. 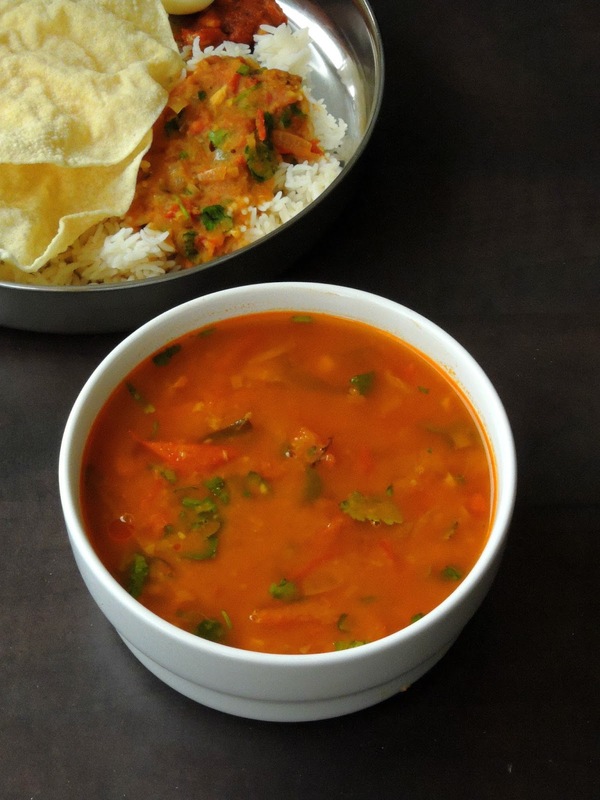 This dal is a super easy dish to prepare as you just need a pressure cooker and a kadai. How simple na, yes cook the dal with turmeric powder, and temper it along with sauteed onions and tomatoes. Yellow moong dal is definitely a nutritious dal with dietary fiber in it. Extremely protein rich, moongdal is often cooked in my cooking. As this yellow moongdal are easy to cook, you can dish out many delicious dishes out of it quickly with less efforts. 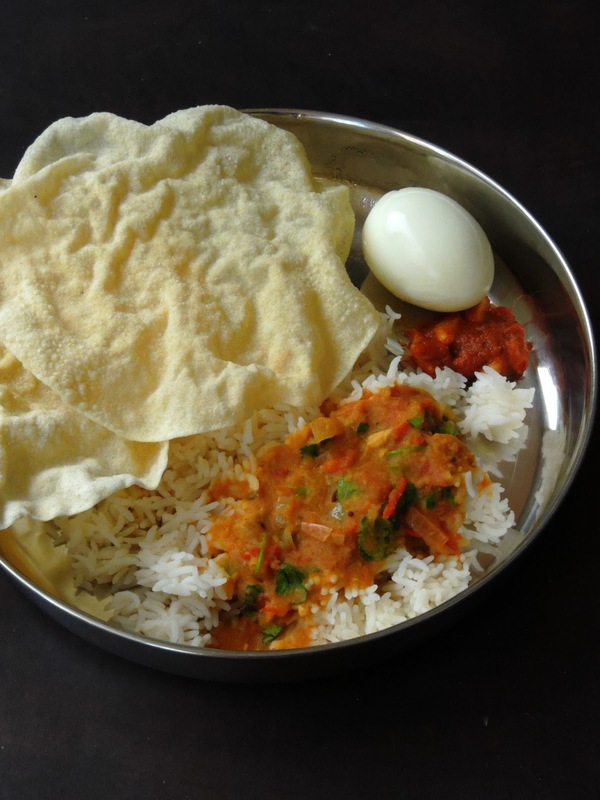 We finished our weekday lunch with this Tomato pesarapappu with papads, boiled eggs and some garlic pickle. Trust me this curry tastes simply delicious with hot piping rice topped with ghee. Simply flavored with ginger and garlic, this lipsmacking dal will definitely become your favourite dal. Am running this week's blogging marathon with Lentils salad and sides, obviously this comforting dal goes for this week's theme. Pressure cook moong dal with turmeric powder and enough water till it turns mushy. Heat oil in a pan. Let splutters the mustard seeds, cumin seeds and curry leaves. Now add the dry red chilli and add chopped onions, green chilli, garlic and ginger, saute until the onions turns transculent. Add the chopped tomatoes along with salt and red chilli powder, cook until the tomatoes turns mushy. Finally add the cooked moong dal, add enough water, cook until the dal turns bit thick. Sprinkle some chopped coriander leaves and put off the stove. I am sure this combination must have been a super hit! very nicely done Priya.. Simple recipes always make excellent meals ! This daal must have made a fabulous meal , loving those papads on the side . Moong dal and tomato is fantastic and comforting combination... love this curry with steam rice. Tamata pesaru pappu with papad is such a comforting meal. Most comforting food, looks absolutely delicious. Tomato and pesara pappu very nice combination, I make this often. 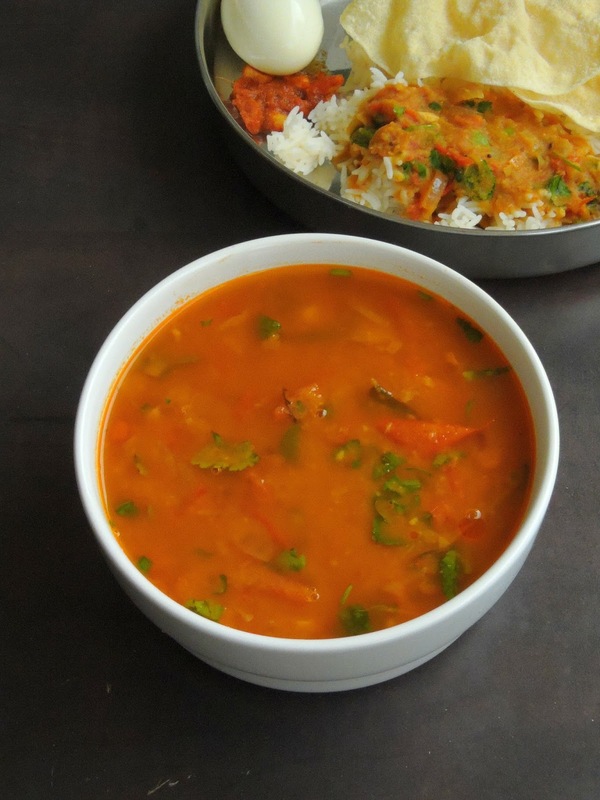 This is one of our absolute favorite dal at home. I make it at least once a week -- so hearty and comforting. That is comfort food for me. I just need this with a bowl of hot rice and appalam and I am a happy soul. Awesome combination. Love it any day. Curry looks absolueteley tempting .. Perfect with Rice.. Very comfort food. Loved it. I still have to come across a family that does not like Moong dal. As you said, its easy to make and taste can be varied according to the ingredients we add. Love it. My family is a moong dal eater family. I make it at least thrice a week. They can have it all seven days of the week. This could be a nice variation to our Punjabi style of moong dal. Going to try it tomorrow only.